One of the things to consider when constructing a patio is the roof. A patio roof makes a big difference in comfort, especially during summer months. In selecting a Phoenix roofing style for your patio, choose one that complements the overall look of your house so that your patio appears like a natural extension of your house. At the same time, the roof design should provide you with maximum protection from natural elements. There are several patio roof designs that you can choose from, the most popular these days being the dome and gable styles. Patio roofs could be constructed using various materials. Each of the different roof designs and materials provide distinct advantages. Gable. One of the most popular choices for patio roof, gable consists of two angled roofs that meet at the apex in the middle. The pitched roof allows the rain to slide down to the gutter to prevent water pooling while affording maximum coverage from the heat and rain. Lattice. This type of patio roof consists of lattice-like covering than is thinner and shaped simpler than those used for a pergola and forms a rectangular structure. It is perfect if your home is more contemporary in design. As in other outdoor roofs, using a durable wood that could withstand the elements is the key to long years of service. You can spice it up by adding fabric to the lattice structure, which offers more shades against the sun’s heat. Cloth. A very practical way of dressing up your patio using inexpensive clothing materials. You only need to put up the posts, attach the fabric using wires to hold it in place, and you have a beautiful shade over your patio to keep the heat away. Pergola. This is the more traditional type of patio roof, which consists of pergola columns, purlins and rafters. The combination of posts and crossbeams create an open roof. 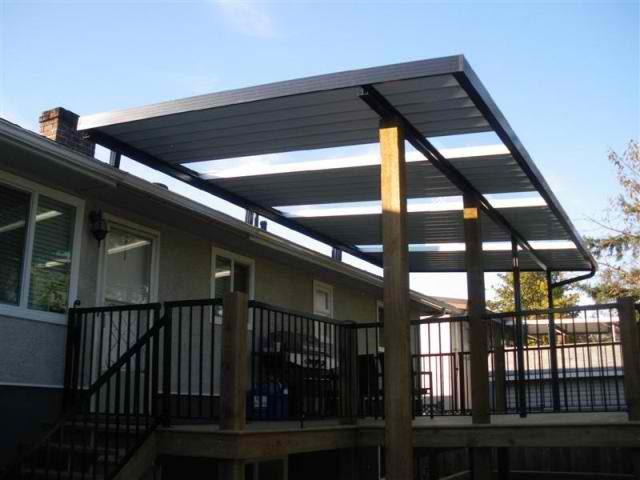 A metal framework acting as roof works just as well to form a more modern pergola. This type of patio can be attached to the side of the house to form a semi-covered patio. A pergola does not always require a flat roof; it only needs an open roof that allows the light in. Dome. This Phoenix roofing design is gaining popularity among homeowners. While it has a lesser arch than a gable roof, it provides excellent protection against the rain. To make the domed roof of your patio complement the style of your house, you can adjust the height of the dome so that it blends perfectly with your house. Green, White or Solar Roof: Which Seattle Roofing Type is Best for Cold Climates?